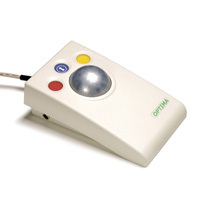 The Optima Trackball from Pretorian is a durable desktop trackball designed with the requirements of users with limited motor skills in mind, yet totally suitable for use by a wide range of users. The angled housing provides an ergonomically supportive position for the hand by providing a place to rest during use. 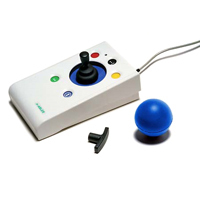 The large 2" diameter trackball rises 0.7" above the trackball housing, presenting a significant profile for the hand to make contact with. 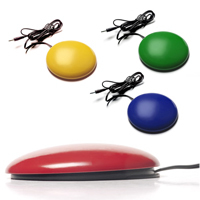 The free-running trackball is securely mounted in the housing and offers smooth movement from even a light touch. Tracking is provided by an optical sensor which eliminates mechanical parts which can fail from wear while still offering precise tracking and cursor control. 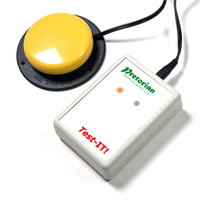 Colour-coded and recessed control buttons for Left Click, Right Click, and Drag-Lock are positioned above the trackball. 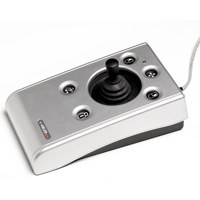 The recessed location assists users in guiding their fingers to the appropriate buttons as well as preventing accidental activation that could occur with flush or raised buttons. 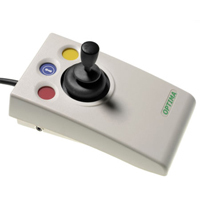 In addition, the Optima is also equipped with dual ports which accommodate the attachment of external switches for activation of the left and right click functions. 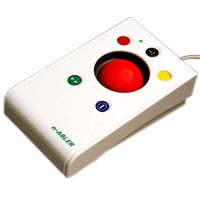 These can be used to offer users with limited motor control alternative methods of clicking. Pretorian Technologies' innovative APPlicator is a Wireless Switch Interface that can provide Scanning Switch Access to Switch Adapted Apps, Music and Photography from just a single switch (it does support the use of up to 4 switches). Bluetooth technology links this device to the iPad, iPad mini, iPad Pro and iPhone, as well as other Bluetooth enabled tablet devices or computers such as Android and Surface Pro. 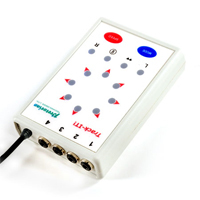 Up to four switches can be connected and programmed to any of 24 functions via the convenient built-in display. An integrated button on the APPlicator deploys or hides the on-screen keyboard at any time with just a single touch. 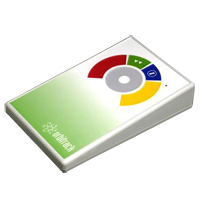 There are a variety of features that provide for quick access to commonly desired functions. The Quick Media button provides instant preconfigured access to basic media function such as play/pause, skip forward, skip back and 10 second timed play, and with a switch set for "Volume Up" users can easily capture images or video with the Camera App. 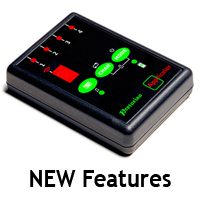 New features now available (2018 Black models) include a new "Keypad Lock" that prevents inadvertent changes to settings, a programmable "single-shot" mode for users who find removing their hand from the switch difficult, and a manual power-off feature for use when the unit is being transported. To see examples of switches which can be used with the APPlicator, check out our Switches category. The Smoothie Switches from Pretorian are low profile, low force, large diameter switches for the ultimate in easy and comfortable switching. Operates over the whole switch area of 75mm or 125mm). Industry standard fixing holes for easy mounting (125 mm models only).